Mike Busch, Maryland’s long time Speaker of the House of Delegates, was eulogized at his funeral yesterday as an outstanding Marylander, a dedicated public servant and a fearless advocate for the causes he believed in. During the service at St. John Neumann Church in Annapolis, Gov. Larry Hogan, a Republican, recalled his last phone conversation with Busch shortly before the speaker’s death April 7 at the age of 72. Hogan said he and Busch, a Democrat, “had a heart to heart” about how the partisan battles and the political rivalries weren’t really all that important. “And we agreed what really mattered was our family, our loved ones and the profound sense of pride that comes with serving the people of Maryland,” Hogan said in a halting voice. He and Busch may have come from different sides of the aisle, Hogan said, but they worked things out. There was even more bipartisanship. Richard Duden, now an Anne Arundel County District Court judge, said he and Busch both owed their old jobs in the county’s Department of Recreation and Parks to Bob Pascal, then the Republican county executive. It was in those early years at recreation and parks, Duden said that he got to know what a “special guy” Mike Busch was. Bruce Poole, a Hagerstown lawyer who entered the House of Delegates in the 1987 freshman class along with Busch, was certain he knew everybody. He recalled standing in line waiting to get their House of Delegates license tags early in their careers and grumbling about how long it was taking. He didn’t have a place to stay, he said. He wanted to get to the Naval Academy to get a pass to work out there during the legislative session. And he was sure he wasn’t going to get his tags. The guy in front of him—Busch—turned around, introduced himself and gave him the name and number of the woman who ran the Ramada Inn at the time. She’d take care of him, Busch said. He gave Poole contact information for the head trainer at the Naval Academy. As the laughter died down Poole turned serious. He said Busch was not one to curse the darkness, nor to light a candle, but to light a torch, instead; a torch for students and working folks who couldn’t make ends meet and for people who couldn’t get insurance. But for all those who praised Mike Busch’s his role as a teacher, a coach, the speaker of the house, an advocate for social justice, his daughters saw something else. To Erin, the older daughter, he was the dad who never missed a game, never missed a play and never missed a chance to make sure she and her sister had a good laugh. Meghan, the younger daughter, recalled the middle school basketball game in which she missed all her lay-ups and her dad, the coach, drove her home in silence. Then he told her to get a ball and get in the backyard. And she shot lay-ups until he said to stop. She said he cared for them with a passion unlike anything she’d ever seen. 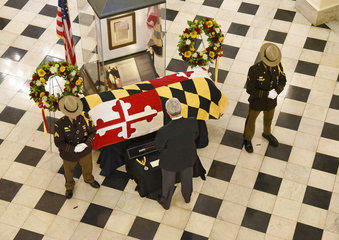 The late Maryland House Speaker Michael Busch arrived at the State House Monday for the last time. Busch died on April 7 at the age of 72. The General Assembly wrapped up its 439th session Monday night in Annapolis, and for the first time since 2003, Michael Busch wasn’t overseeing the House of Delegates as speaker. Busch died Sunday at the age of 72 after he was hospitalized with pneumonia. The frenzied, celebratory atmosphere that’s typical on the last day of the General Assembly’s 90-day session was marred by Busch’s absence.